DE WIT - Tabula Tartariae et majoris partis regni Chinae. DE WIT, F. - Tabula Tartariae et majoris partis regni Chinae. Tabula Tartariae et majoris partis regni Chinae. - DE WIT, F.
Title : Tabula Tartariae et majoris partis regni Chinae.. Size : 17.2 x 21.7 inches. / 43.6 x 55.0 cm. Description :Stretching from the Caspian Sea in the west to Formosa in the south-east. Including the peninsula of Korea, Japan and the east coast of Yedso. The Great Wall of China is shown, along with a the mythical lands to the north. Russia is truncated with no Kamchatka peninsula and Yedso is shown according to the voyages of De Vries. Decorated with finely engraved mountains and trees. 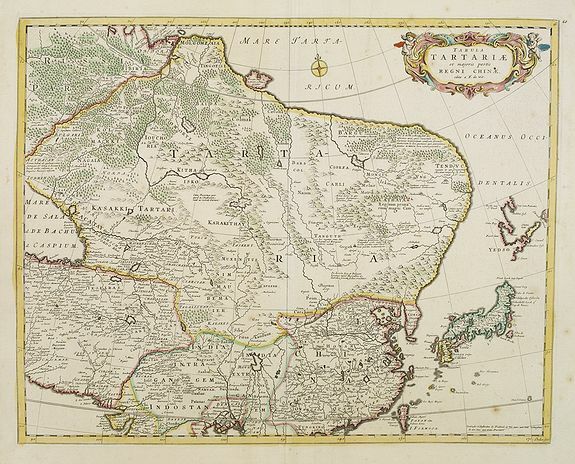 The map was engraved by the distinguished Amsterdam engraver Jan l'Huilier. Condition : Paper slightly age-toned, for the rest in good condition.